Rhythm and Blues in New Orleans is a comprehensive history documenting the rise and development of a unique musical form. Originally published in Great Britain under the title Walking to New Orleans, this revised edition has more than 100 new pages of interviews and information chronicling the careers and music of the major R&B artists. Broven has included the important peripheral activity of the New Orleans music industry in the areas recording studios, clubs, and record companies. Much of the material comes firsthand from the musicians who helped create R&B as a musical genre. The author’s original interviews have been augmented by fresh research and new conversations with the artists. 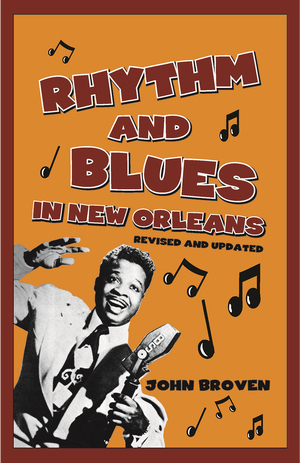 Broven completely covers the dramatic rise and fall of the Golden Age of New Orleans Rhythm and Blues from the 1940s through ‘60s and now adds the legacy to date of this powerful and influential regional sound. The book features such R&B stars Fats Domino, Ray Charles, Professor Longhair, Huey “Piano” Smith, Wardell Quezergue, and Little Richard. Nearly one hundred photographs are included, along with a complete appendix featuring a list of best-selling records produced in New Orleans. John Broven, a contributing writer for the British magazine Blues Unlimited, is also the author of Pelican’s South to Louisiana: the Music of the Cajun Bayous. He has been an ardent fan and collector of Louisiana music for twenty years, and is an honorary member of the Louisiana Music Commission in recognition of his research into the history of the state’s music.